Recently I introduced you to the Dialogic Change Model that the Collective Leadership Institute developed to help you facilitate a process design that is owned by all stakeholders. Today I want to dive deeper into the first phase. Phase 1 is essentially about creating the resonance for the envisioned change and exploring the Stakeholder Dialogue’s context, taking other existing initiatives and the people involved into account. Talking to selected but relevant stakeholders and opinion-leaders informally in this phase can help to understand the prospects and potential obstacles for dialogue and change. A small cross-sector team of engaged people, called the Container, can meet at various opportunities, exchange ideas and receive inputs from interested and knowledgeable people in this phase. The 4C project is a cross-sector partnership between coffee traders, producer organizations and international civil society organizations that aims at improving conditions for all participants of the coffee value chain. In phase 1 actors from both private sector and public sector stayed in dialogue about the initial idea to influence the mainstream market towards greater sustainability. When people met repeatedly on similar issues and specific topics around coffee and sustainability, the idea of developing a mainstream standard slowly began to take root. The challenges were tremendous. The attempt to create an international mainstream coffee code had to take into consideration that, with several big roasting companies involved, the European and American Anti-Trust Authorities would begin to look closely. Any suspicion that the initiative would intervene into the free market laws or distort open competition would have caused an intervention. The same applied to the topic of prices: although a possible increase of price for green coffee was in the interest of coffee producers, for anti-trust reasons the topic could not even be discussed in the initiative. This was very difficult to understand for many of the actors in the coffee chain who tended to assume the big roasters would just use this argument to avoid any discussion on prices. But despite the challenges and the absence of easy answers the initiative found support in many different countries in Asia, Africa and Latin America. The ambitious idea to create a positive impact on coffee producers through an international common code of conduct slowly began to take shape. Much of the promotion of the idea took place informally: alongside international conferences on coffee contacts deepened, relationships were built and people became convinced that the ambitious idea was worth pursuing. Do you want to check if your project has covered the most important aspects of Phase 1? 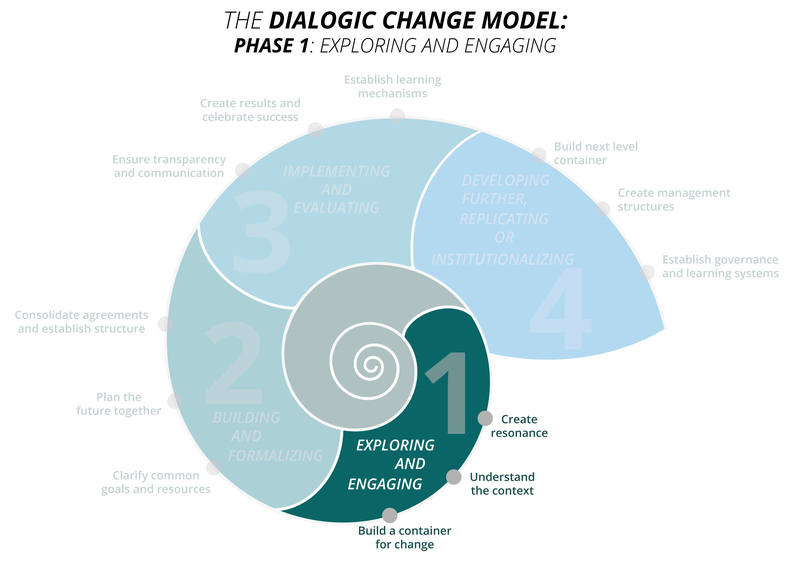 Our tool Dialogic Change Model Phase 1 will help you assess the progress of your Stakeholder Dialogue and give recommendations on what needs to be done to step into the next phase of engagement.